This set features three Color Brushes in black, gray and sepia. Color Brushes offer a convenient, portable alternative to traditional brushes. 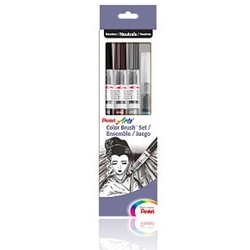 The nylon brush tip pen is filled with water-based ink. The ink flows easily, dries quickly, and produces transparent watercolor effects. Refill cartridges are available. The set also includes a medium tip Aquash Water Brush that can be used to smooth and spread color, and create an array of dramatic effects.